Secretly located off the village's most prestigious road along Twiss Green Lane, Ivy Farm Gardens is an exclusive and prestigious gated development of only four elite and executive homes that were individually designed and built. Occupying an enviable corner plot and prime position within the cul-de-sac, our sellers have cleverly extended the original footprint to create extensive and spacious family living accommodation throughout (which somehow still remains very cosy and homely), which has suited their growing family over the years. 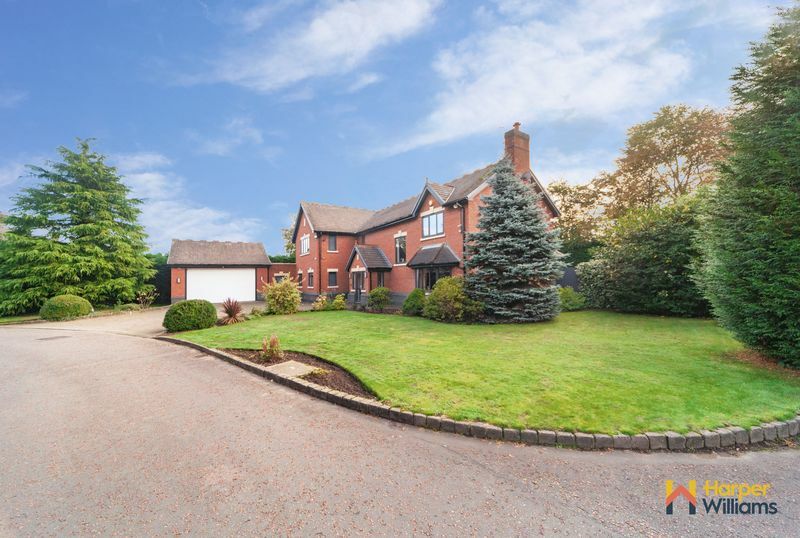 From the moment you walk up the driveway, you will be in awe of the property's grandeur. An internal viewing will reveal, a well appointed entrance porch which opens into the fabulous reception hallway which provides access to all the ground floor accommodation which includes a formal lounge, cloakroom/ boot room, game room/ separate dining room, WC, and an ultimate hub of home 'Wow Factor' open plan ground floor kitchen and dining and living areas perfect for everyday living and of course entertaining and family parties with bi-folding doors from each living area onto the rear garden. There is a separate utility room off the kitchen which opens onto the external courtyard area which leads to the garage and a study off the dining room. 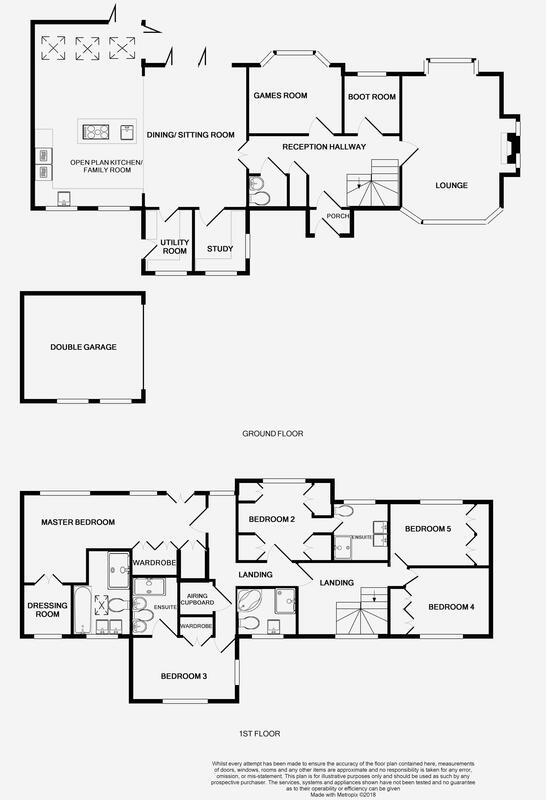 To the first floor there is a generous landing with a feature pane to the front aspect, five double bedrooms, three with deluxe ensuite shower rooms, a contemporary family bathroom, and a simply stunning master suite with a feature vaulted ceiling which boasts a fabulous dressing room area with a Juliette balcony overlooking the rear gardens, walk-in wardrobes and a luxurious ensuite bathroom again with a feature vaulted ceiling which adds another 'Wow Factor' to the first floor accommodation. Externally the property sits on a large plot with generous gardens to the front, side and rear with a large driveway and a detached double garage. 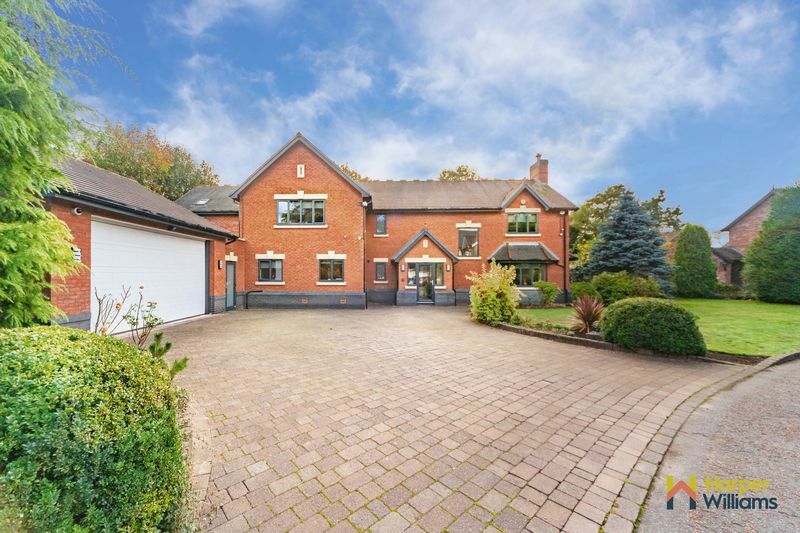 The rear garden is extremely private being not overlooked and is very well established. These properties very rarely come to the market, so this is an opportunity not to be missed if you are looking for a sought-after location close to excellent schooling options, including the highly popular Twiss Green Primary School and privacy within a semi-rural setting. 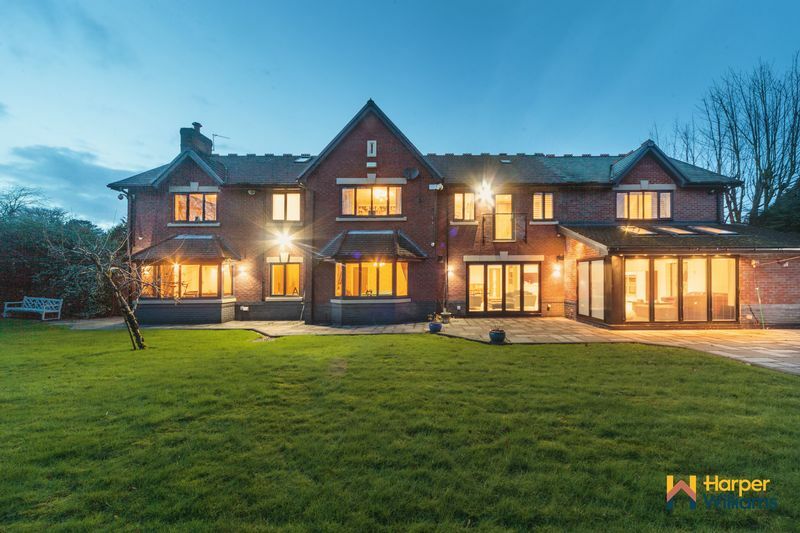 Only by having an internal viewing will you be able to truly appreciate the overall space, standard of finish and well designed and executed quality of build on offer. Not to mention the exclusive location and privacy of this home's position. A well appointed entrance porch with contemporary Anthracite grey double glazed entrance door opening into the tiled entrance porch with a double glazed window to the side aspect, ornate coving and a ceiling light point. Further Arthracite grey double glazed entrance door leading into the reception hallway. 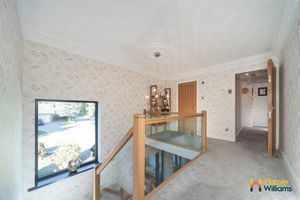 A fabulous reception hallway which is very light with floods of natural light coming through the glass entrance porch and feature window to the front aspect. 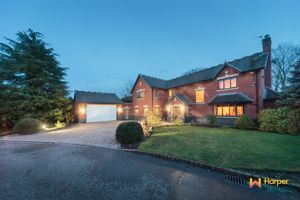 There is feature ornate coving to the ceiling and contemporary spotlights, feature archway into the inner hall, modern central heating radiator, oak doors leading to most of the ground floor accommodation and beautiful oak and glass staircase leads to the first floor. Double entrance doors open into the stunning open plan kitchen and family room. Providing ample storage for coats and shoes with a ceiling light point. Alarmed. 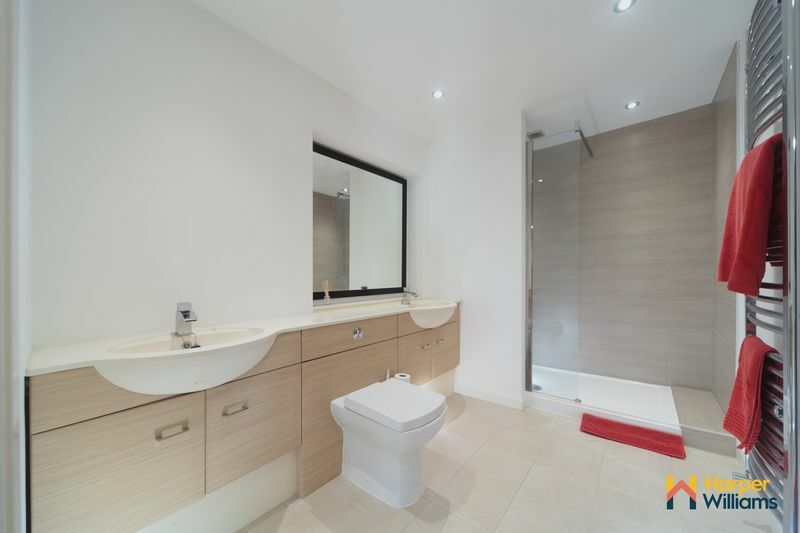 A modern ground floor WC fitted with a white low level WC and vanity wash hand basin with chrome fittings, double glazed frosted window to the front aspect, central heating radiator, vented, laminate floor, tiled walls and ceiling light point. A cleverly incorporated boot room/ cloakroom complete with full length wall fitted wardrobes with ample hanging space and built in shelving and built in storage cupboards perfect for keeping all those coats/ jackets and shoes tidy and providing ample storage space! 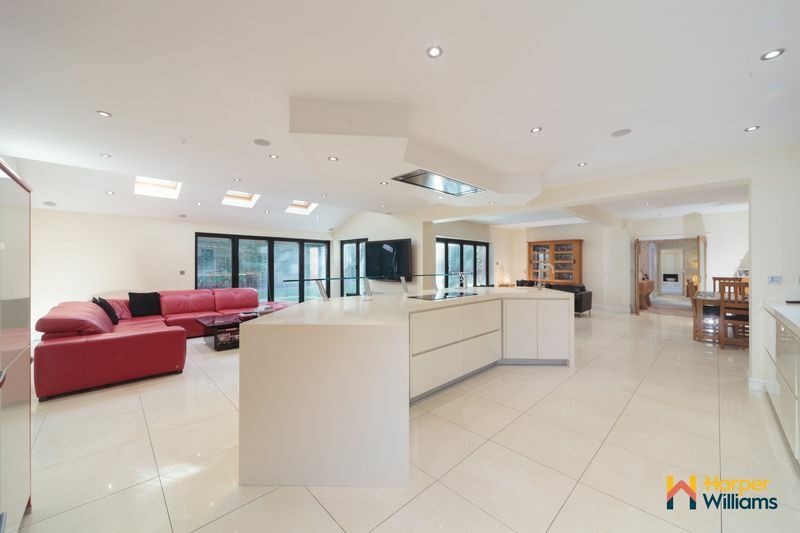 There is an Anthracite grey double glazed window to the rear aspect, coved ceiling and ceiling light point, contemporary vertical radiator and Karndean flooring. 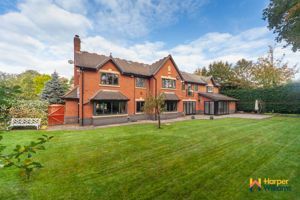 A fantastic formal lounge/ reception room which is exceptionally spacious and light and airy with dual aspect feature bay windows to both the front and rear aspects. 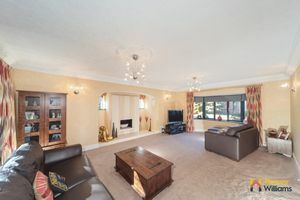 There is a feature open inglenook style fireplace through a lovely feature arch which has a contemporary hole in the wall gas fire inset with glass panes either side of the fireplace. 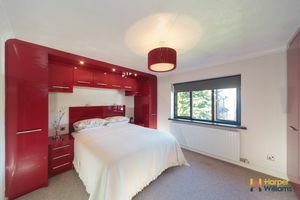 There are four wall lights and two ceiling light points with centre roses, coved ceiling and central heating radiator. A very versatile reception room which is currently being used as a family games room with a feature Anthracite grey double glazed bay window to the rear aspect, oak flooring, coved ceiling and ceiling light point, central heating radiator. 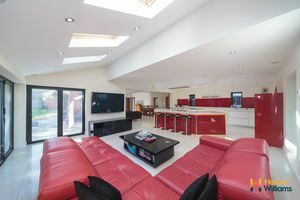 The ultimate hub of the home 'Wow Factor' open plan kitchen and family room with two separate family living areas/ lounge areas and a separate dining area, perfect for modern every day family living or entertaining. 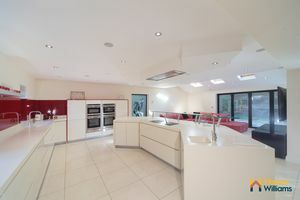 The kitchen boasts an extensive range of cream gloss wall and base units with complementary Corian worktops over and red glass splashbacks including an impressive feature centre island with a glass breakfast bar, Neff induction hob with a stainless steel extractor fan built into the lowered ceiling, additional sink and under breakfast bar lighting. There are a range of integrated appliances including 4 Neff ovens with two plate warming drawers, quooker tap with inset sink, integrated fridge and dishwasher. There are two Anthracite grey double glazed windows to the front aspect, three velux windows to the family lounge area and separate bi-folding doors opening onto the rear patio area. 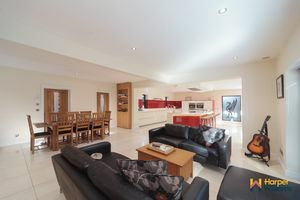 Complementary tiled floor with underfloor heating continues throughout. 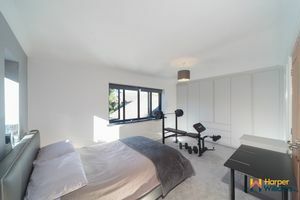 Spotlights to the ceiling and Sonos sound system connected to the master bedroom sound system and master ensuite bathroom. 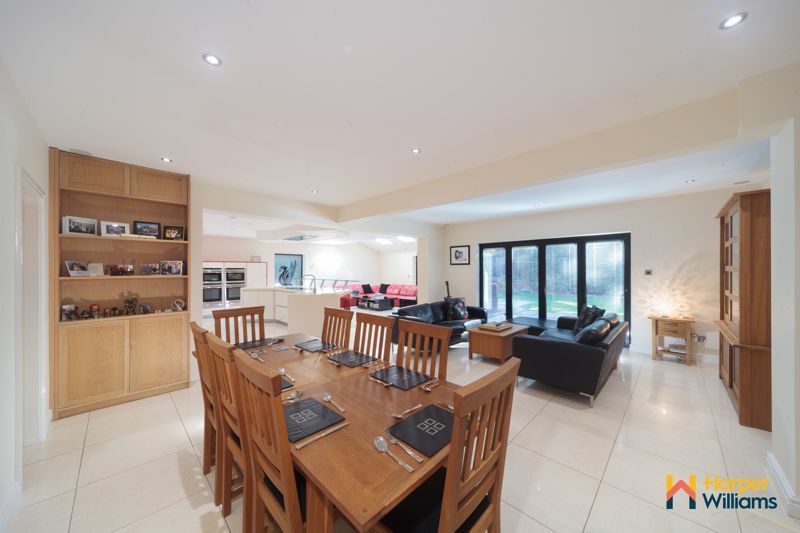 Flowing open plan off the kitchen, this is a generously spacious family dining area with a separate lounge/ sitting area with bi-folding doors opening onto the rear patio area, again perfect for summer days and family parties! 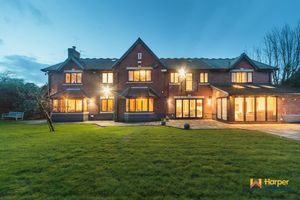 There are double oak and glass doors from the reception hall, tiled floor with underfloor heating which continues throughout this open plan space and spotlights to the ceiling. 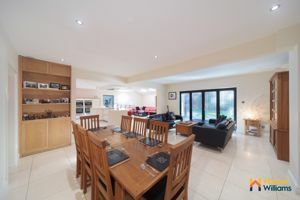 Situated off the dining room, a perfect home study with extensive fitted office furniture, bright and airy with double glazed windows to both the front and side aspects, tiled flooring, contemporary vertical radiator, coved ceiling and ceiling light point. Telephone point. An essential for any modern family, this substantial utility space comprises ample contemporary grey gloss wall and base units with complementary Corian worktops over incorporating a sink with a mixer tap and drainer, wine fridge, Worcester boiler, fridge/freezer, plumbed for washing machine and vented for a dryer, tiled floor and spotlights. There is a double glazed window to the front aspect and an Anthracite grey double glazed entrance door to the courtyard garden. A very spacious landing split into two parts with a feature glass pane to the front aspect providing ample natural light, bespoke oak and glass staircase, ornate coving and centre rose to the ceiling light point (focal hanging spot down the stairs). Oak internal doors to all first floor accommodation. 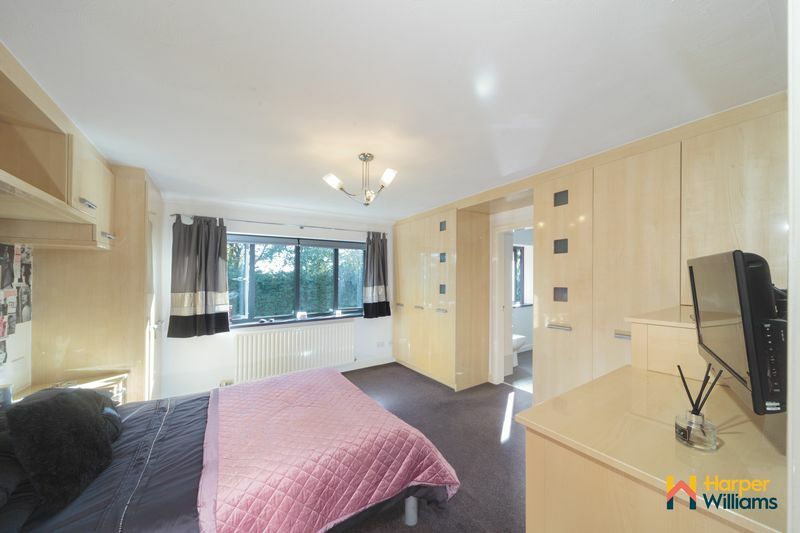 A good size double bedroom with one Anthracite grey double glazed window to the rear aspect, fitted wardrobes in modern zebra wood effect, coved ceiling and ceiling light point, central heating radiator. Situated to the front of the property with a large double glazed window to the front aspect, an extensive range of red high gloss fitted wardrobes and bedroom furniture, coved ceiling and ceiling light point. Central heating radiator. A contemporary bathroom fitted with a four piece suite in white comprising a corner bath with shower attachment, low level WC, tiled shower cubicle and vanity wash hand basin all with chrome fittings. 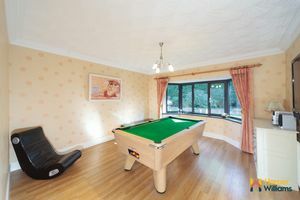 Fully tiled walls and complementary tiled floor. Double glazed window to the front aspect, fitted mirror with lighting, central heating radiator and spotlights. 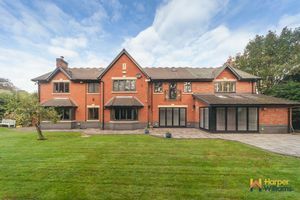 Leading from the first floor landing through an oak door providing access to bedrooms two, three and the 'Wow Factor' master suite. Double glazed window to the rear, large built in airing cupboard and access to the loft area, Central heating radiator, coved ceiling and three ceiling light points. A generous double bedroom with an extensive range of fitted light oak effect high gloss wardrobes and bedroom furniture with a large double glazed window to the rear aspect, central heating radiator, coved ceiling and ceiling light point. Oak door into the ensuite. 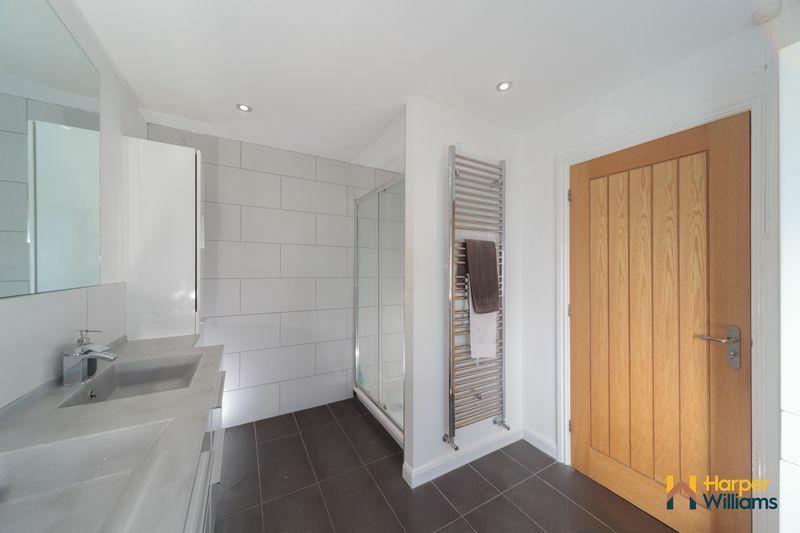 A luxurious ensuite shower room which is newly fitted comprising a double tiled shower cubicle, wall mounted twin sink vanity wash hand basin unit and low level WC all with chrome fittings and stylish Porcelanosa fully tiled walls with complementary contrasting tiled floor. Chrome ladder style radiator, double glazed window to the rear aspect and spotlights. 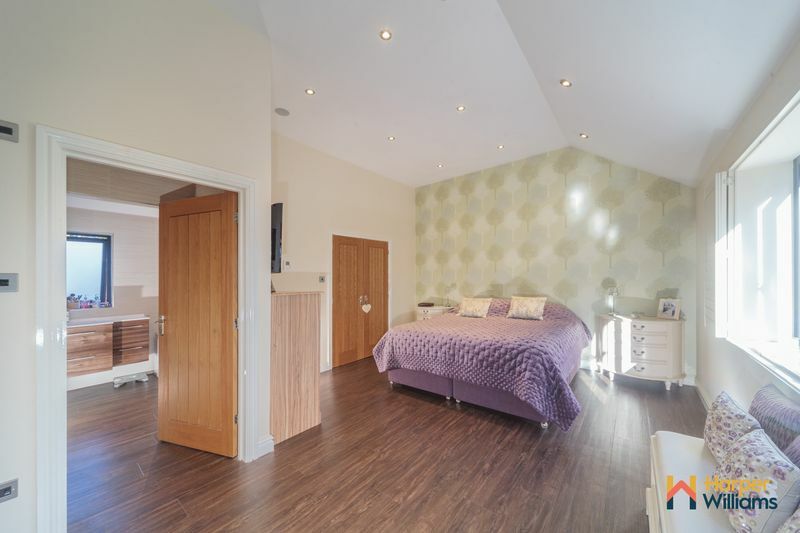 Another generous double bedroom suite with extensive fitted light grey matt finish wardrobes across one wall with an additional fitted double wardrobe with oak doors. Dual aspect double glazed windows to the front and side aspects, central heating radiator, coved ceiling and ceiling light point. Oak door into the ensuite. Another deluxe contemporary ensuite complete with a double tiled shower cubicle with glass screening, wall mounted twin sinks in a vanity unit and low level WC all with chrome fittings. 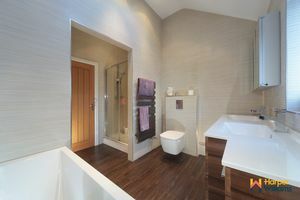 Complementary Porcelanosa tiling to the walls and floor. Vented. A simply stunning master suite complete with two walk-in wardrobes, dressing room area with a feature Juliette glass balcony overlooking the garden, feature vaulted ceiling, Sonos sound system linked to the kitchen system and a luxurious ensuite bathroom. 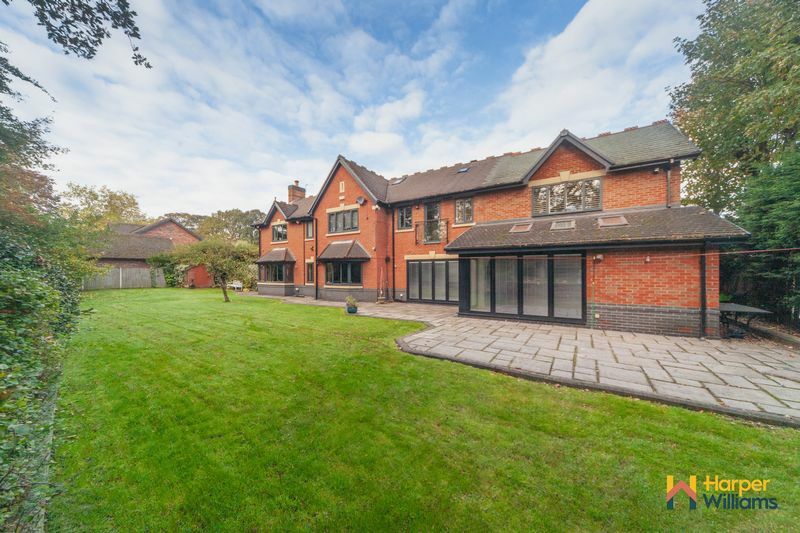 There are two large double glazed window to the rear aspect and spotlights throughout. 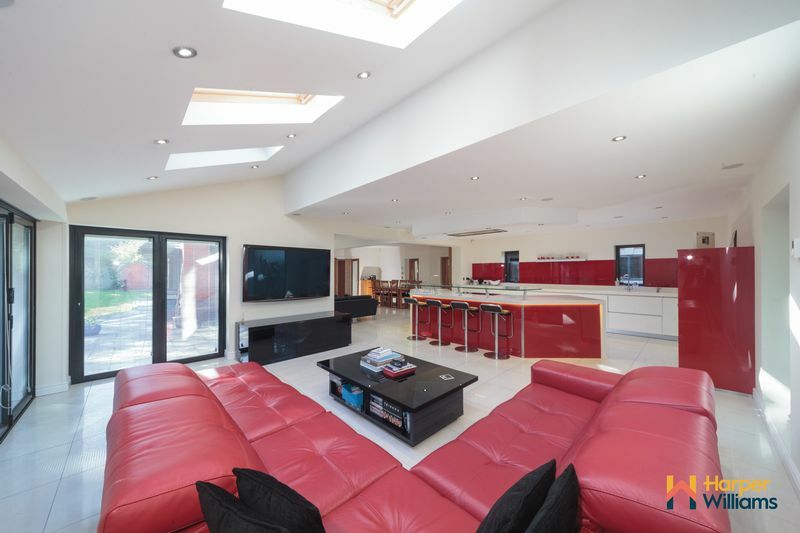 With ceiling light and double glazed window to the front aspect. 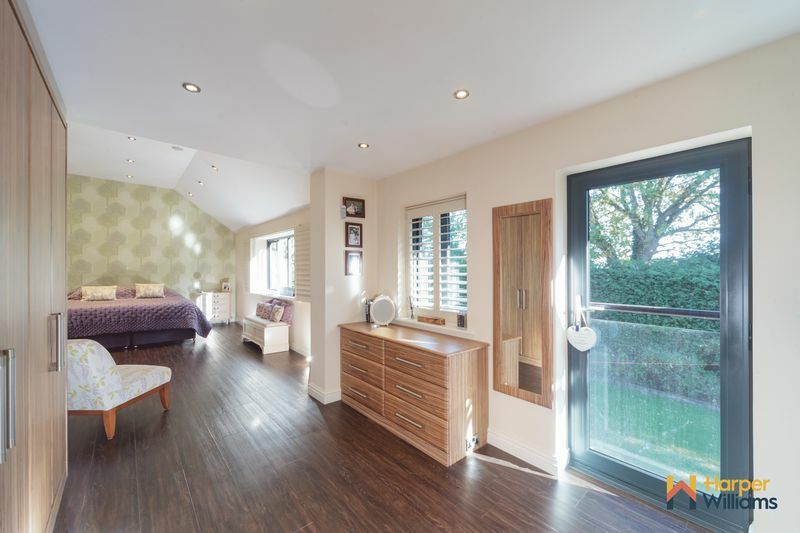 An equally stunning ensuite bathroom again with a feature vaulted ceiling with a velux window and double glazed window to the front allowing floods of natural light. A four piece suite in white comprising a bath with shower attachment, double shower cubicle and wall mounted twin sinks in a vanity unit. 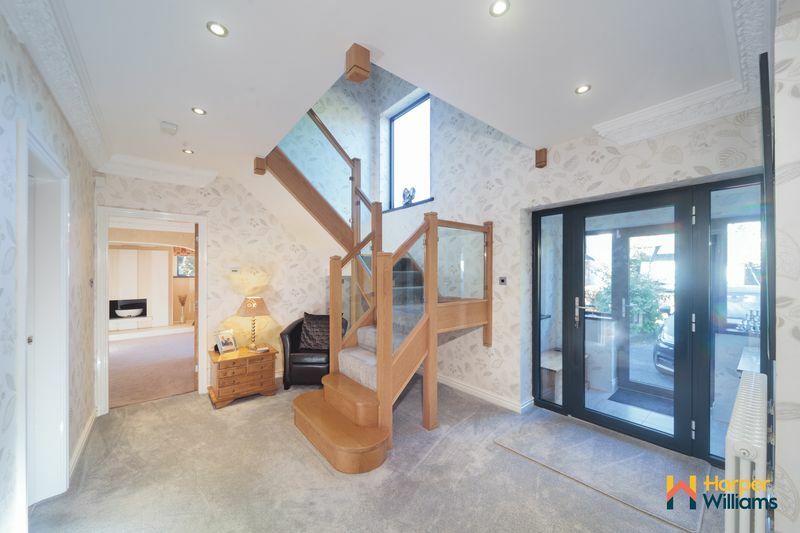 Karndean flooring, modern ladder style radiator and spotlights. Vented. 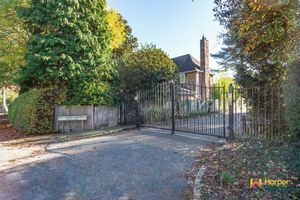 Accessed via the electric gated entrance, to the front of the property there is a large paved driveway providing parking for several vehicles leading to the detached double garage. 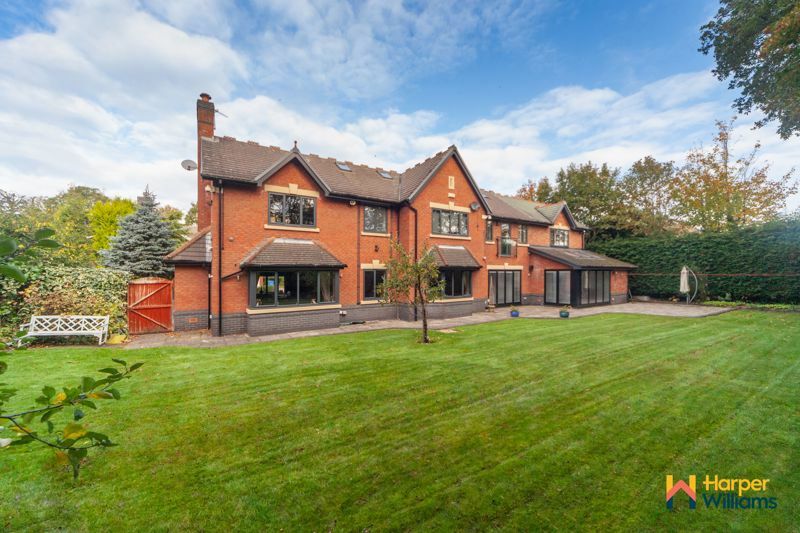 There is a beautifully landscaped garden laid mainly to lawn with well established borders. 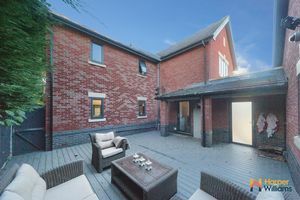 There is a courtyard style garden to the side of the property which is completely private and not overlooked and decked for low maintenance in a contemporary grey, access off the utility. To the rear, there is private rear garden which is not overlooked and well stocked with mature trees and planting, laid mainly to lawn with a separate patio area, perfect for outside entertainment/ relaxing. There is an outside water tap, power point and garden shed.